Well, been quite lazy really since I got home from a hard days work. Worked very hard at the lab all day, time consuming stuff, but time flew as I enjoy doing it. This evening I demonstrated the ultimate in lazyness by not only doing the food shopping on the internet for home delivery, but I also borrowed mums walking stick when the delivery man came round and pretended I couldn’t move. He kindly packed all the groceries away for me and made me a lovely cup of tea. He even got a spare pack of biscuits out of his van and gave them to me for free. I got chatting to him and he’s a very nice man called Tim, turns out his wife works in the same building as me but in another department – gonna have to keep my head down just in-case she clocks me without the walking stick, although my limp might act as a good cover story. My limp is getting better though, slowly but surely. If I keep up the walking, maybe twice a week to work and back then my GP says I’ll be right as rain by Christmas. Then its back to the trampolines again. People treat other people very differently when they have something wrong with them. Before the accident I always ‘blended into the background’. 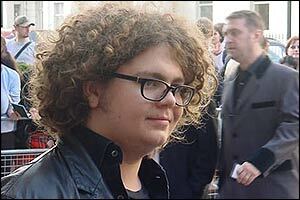 Now I get called quazzi modo and jack osbourne all the time – I blame this mainly on television. Why you may ask? Well, the whole name calling mentality is because it is very easy to label someone as another recognisable person rather than confront the fact that the person is different. Television brings us so many recognisable faces, often injured or disabled peoples attributes are focused upon. 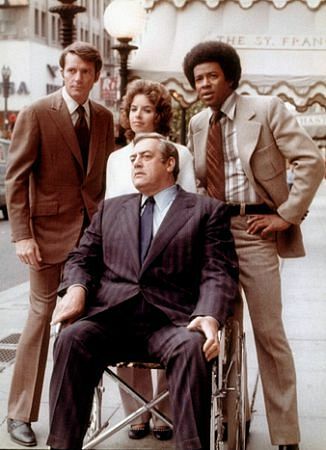 I used to work with an overweight man in a wheelchair, he got called Ironside behind his warped and twisted back. Why? Because its easy to do. And funny for that matter. I called him Stanley though because its his name. And he was my boss. If TV didn’t exist the perhaps more people would have called him Stanley. Ironic that Stanley was put in a wheelchair in the first place by lifting heavy television sets without bending his knees. Stanley. Does the bloke on the left look like his leg looks 'wrong'? Enough of my rants. I was going to have a benny about my podcast mp3 hosting but everything is fixed now (my competition MP3 is now working – please download it!!!). I’m going to write an article on ‘Podcasting for free’. So far I’ve spent approximately £0.00 on podcasting (that’s $0.00 for all you Americans). If I had the money then I’d quite happily spend it on equiptment and hosting. I’ll be writing about my expierences with all the free services. The funny thing is I haven’t got anything worthwhile to say and I’ve now got 29 listeners, imagine the potential from someone with something interesting to say like Ghandi who hasn’t got any money but has a real message to convey. Then compare this to Airbrain Hilton and her million dollar promotionalcast, with nothing to say except ‘Yeah whatever’ and ‘Talk to the hand cos the face aint listening’ for 20 minutes a week. Give me Ghandi anyday. The only thing those two have in common is that they both starve themselves to death in order to get noticed. At least Ghandi did it for a good cause. And hes not a dumb blonde who i hate. Talks about - Indian, war, food. Interesting topics - "Let my people go!" Clothing - Bugger all - shes rich because she doesnt spend money on anything warm. Talks about - frocks, handbags, being famous. dull empty women stuff. I’ve had a good day in the end. I thought I had upset a couple of people I care about this morning but when I got home from work and read my email everything seems ok. I have learnt a valuable lesson today, the blog is indeed a powerful tool, open to misinterprition. Care is needed when posting, whacking things up willy nilly without thinking things through can offend. Paris Hilton is a dopey whore though. Allegedly. Nice read Rog... thanks for taking the time. When did that happen in the film? I got bored towards the end and switched off. Sound like a professional news anchor the next time you create your own podcast or vblog with this podcast tool by VBlogPro.com.